A fascinating Swedish carpet with a unique design, this mid-century kilim from Scandinavia exemplifies the finest developments in minimalist design with its blue and rust striped composition. 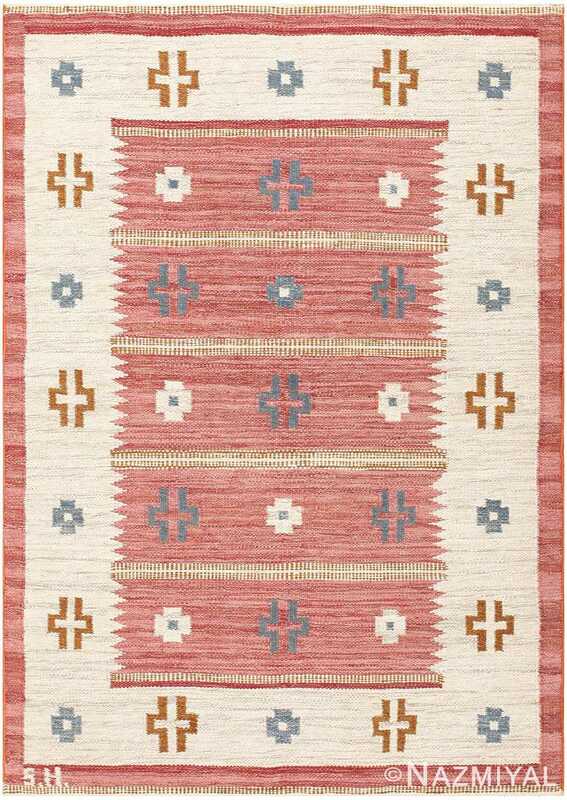 Mid Century Vintage Scandinavian Swedish Kilim, Country of Origin: Scandinavia, Circa date: Mid-Twentieth Century – Here is lovely vintage rug – a vintage Swedish kilim that was woven in Scandinavia during the middle years of the twentieth century. A strikingly simple piece, this mid-century carpet effectively functions as a study of the power of minimal design. 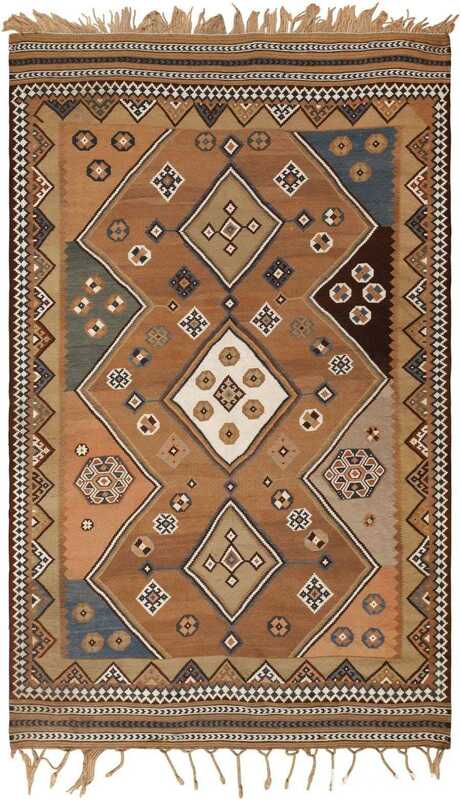 Unadorned by the small detail work of floral and geometric figures that often populate Scandinavian rugs and carpets from this period, this carpet instead consists of a simple, irregular band of horizontal stripes. The carpet itself is colored an intriguing shade of cyan that is almost cerulean: this color is the foundation of the carpet, and colors the narrow terminating bands at the topmost and bottommost portions of the composition. Mixed in throughout the piece, albeit in an eccentric manner, are dozens of horizontal stripes of a compelling rust-brown color. Some of these stripes are narrow, while others are considerably wider. 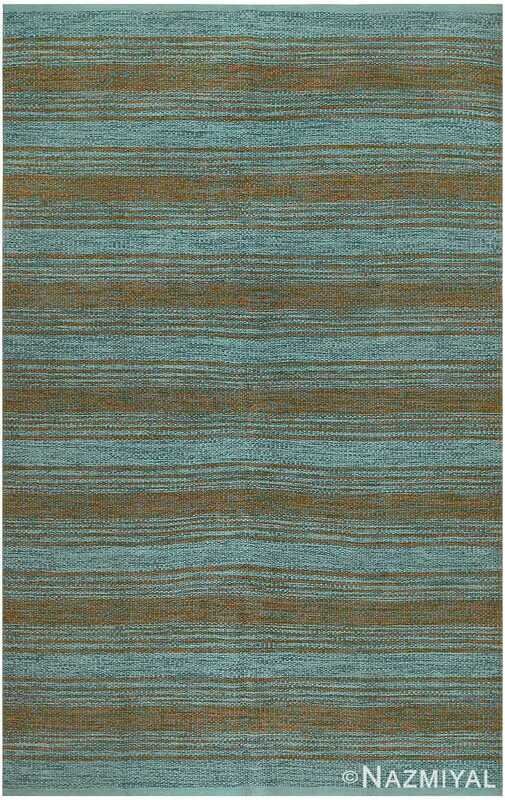 This quality infuses the carpet with a dynamic energy decidedly travels on a horizontal course. A fascinating Swedish carpet with a unique design, this mid-century kilim from Scandinavia beautifully exemplifies the finest developments in minimalist design. Stacked lozenges decorated with ancient protection symbols woven in clear colors dot this beautiful, precisely composed antique Persian kilim created circa 1920. 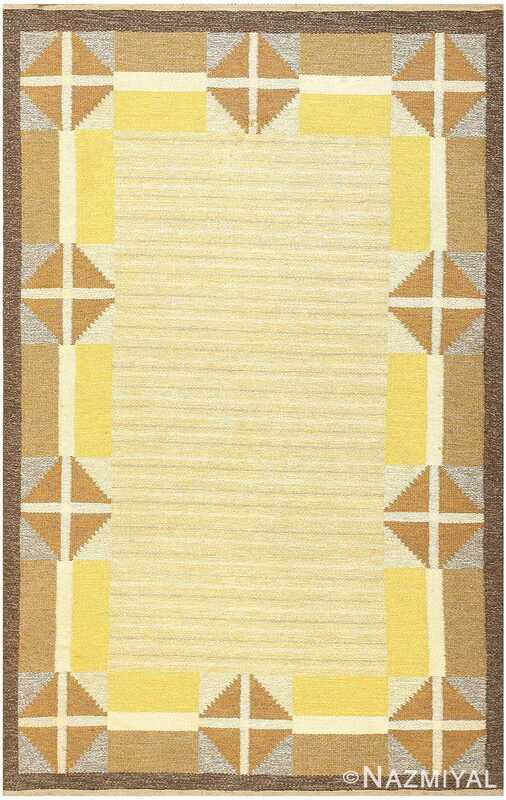 Wonderfully representative of its style, this charming carpet boasts some of the more important developments of mid-century Swedish rug design. Comely pallet of red, ivory and blue are featured in this charming vintage Swedish flat woven kilim rug which is a great example of mid century Scandinavian design.